Our Campuses are identical in many ways but all are an experience like no other. We are passionate about What we do and We can't wait to spend easter with you! Our Anderson Campus is located in Clinton at 96 Mariner Point Drive. Click the link below to see service times, special Easter events, for directions, or to plan your visit! We can't wait to see you there! You can find our Blount Campus at 539 N. Foothills Plaza Dr.. Click the link below to see service times, special Easter events, for directions, or to plan your visit! We can't wait to see you there! Our Campbell Campus is at 2301 Jacksboro Pike Suite 3, LaFollette, TN 37766. Click the link below to see service times, special Easter events, for directions, or to plan your visit! We can't wait to see you there! When you plan your visit we'll send you some info about what to expect when you come. We'll also be on the lookout for you to help you with anything you need. Our Farragut Campus is located in Farragut Highschool at 11237 Kingston Pike, Knoxville, TN 37934. Click the link below to see service times, special Easter events, for directions, or to plan your visit! We can't wait to see you there! Our North Knox Campus is located at 5830 Haynes-Sterchi Road, Knoxville, TN 37912. Click the link below to see service times, special Easter events, for directions, or to plan your visit! We can't wait to see you there! Our Pellissippi Campus is located at 10740 Faith Promise Lane, Knoxville, TN, 37931. Click the link below to see service times, special Easter events, for directions, or to plan your visit! We can't wait to see you there! God didn't create faith to cower behind closed doors! we know you're looking for a place to spend Easter. Why not spend it with us at Faith Promise? Keep scrolling for times, locations and Other special events! WANT More info ABOUT EASTER 2019 in your inbox? Looking for ways to invite your friends and family? Our logo is a great way to get the word out. Download and post it on your favorite Social Media platform. 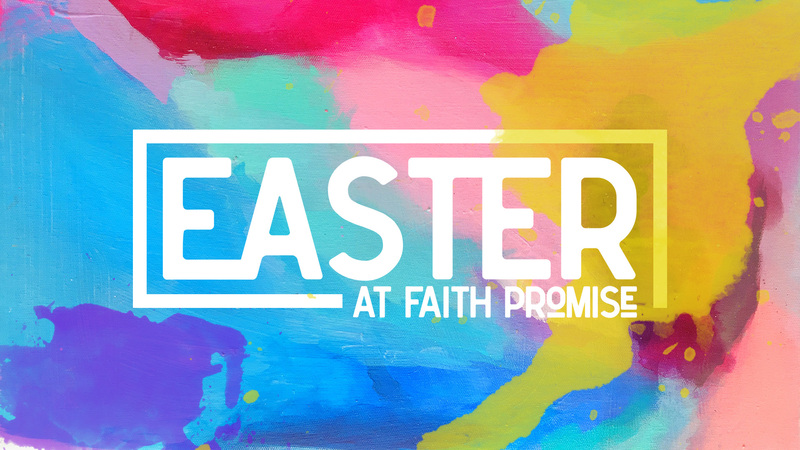 Make sure you tag us at @faithpromise and use the hashtag #fpeaster and the tag your friends you want to invite. These are specifically designed for you to post, text, or email to your friends and family. The inviting part is right on there! Just make a plan of when and where you want to go and ask them if they'll go. Share these videos on your social media, tag your friends, pick a date and time you're going, and tell them to meet you there! It's easy to invite and a group to go together. Can't make to a service in person? We've still got you covered with our Online Campus. Click through to see our service times or click the button to check out our Online Campus site and invite someone to go with you!